Unfortunately I have been quite poorly since before Christmas, though several hospital trips and surgerys later*hopefully fixed now! but still healing, and not as strong as I was *yet* the night before EF one of my legs gave way beneath me and I sprained my ankle. This was the last thing I wanted before EF, I was expecting to wake up and not be able to walk but I was able to limp around and determined to have a good time! and I did:) just couldnt bounce around quite as much as I wanted. I loved the disco ball, and all the art around the hotel, I know some people said the hotel staff werent as friendly, but I thought considering their hotel had been taken over, they were quite happy:) everyone I met always smiled and said hello. 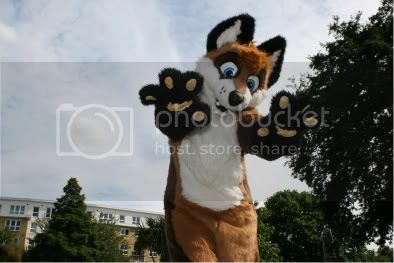 I enjoyed fursuiting, it was relaxing, and Mulder seemed to be well receieved. I thought having two dealers dens was a good idea as it allowed people to spread out a little and therefore not be so crowded and hot, I discovered some friends I didn’t know where coming to EF in the dealers den and it was nice to spend some time with them and catch up on things, I could also see some of their great art in person. I think the staff did a good job managing the door so it wasn’t too crowded inside it allowed you to browse everyones tables without a big swarm of people. I enjoyed meeting up with friends I haven’t seen for a long time and getting to know new ones and spending time with them, doing art and socialising, someone was kind enough to expand the artists lounge to make it bigger and less crowded, though all the artists seemed quite happy to be huddled together. It was a nice thought.